Special Olympics Gibraltar will be participating at the World Summer Games in Athens, Greece this June. Twenty seven athletes will travel to represent Gibraltar in Aquatics, Athletics, Bocce, Bowling, Equestrian, and Football. By this sponsorship you are enabling our athletes to undertake the challenge of participating in these Games where they experience competition which enables skills to be enhanced. Sponsoring an athlete allows the community to share in this support, inclusion and acceptance of people with intellectual disabilities. 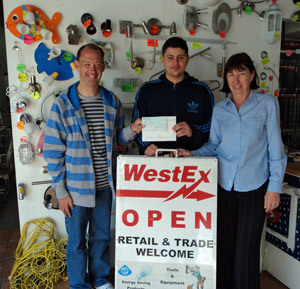 Special Olympics athlete Glenn Wimbleton receives a cheque for £600 from (R) Wendy Aird, Managing Director Westex, and Stores Manager Max Bothe. Wendy has been a long time supporter of Special Olympics. Gib Oil Ltd sponsors John Joshua Buttigeig. 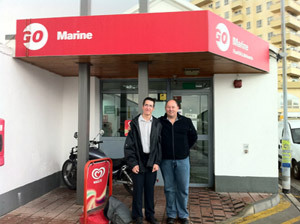 In the picture is John Joshua Buttigeig and Director Commercial Service-Gibraltar Harry Murphy. John Joshua will be participating in Equestrian events. 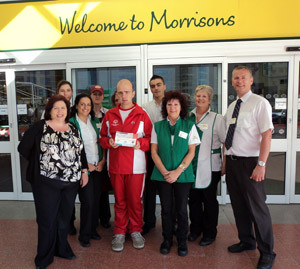 Shane Martinez will be participating in Special Olympics World Summer Games 2011 Athens, Greece in athletics.He has been sponsored by Enterprise Insurance Company PLC.In the picture Gabby (Mother) Keith Newing Finance Director, Andrew Flowers Managing Director of Enterprise Insurance Company and Leslie Martinez (father). 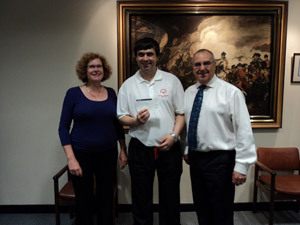 Patrick Slater who will be participating at the forthcoming Special Olympics World Games 2011 has been kindly sponsored by Southern Rock Insurance Company Ltd. In the picture Natalie MacGrath, Nerys Matthews, Pat Slater (mum), Chris Gillingham, Patrick Slater, Maria Carpallo and Amy Barnes. 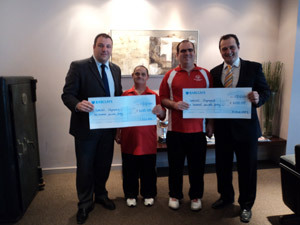 Special Olympics athletes Carlos Yeo (L) and Jan Lopez each receive their £600 sponsorship from (L) Selwyn Figueras, Fiduciary Fund Administration Ltd, and Joey Imossi of Isolas. Carlito and Jan will participate in Bowling and were given warm and sincere wishes to accompany them on their way. Gary Chant, Store General Manager, Wm Morrisons Supermarkets Plc. 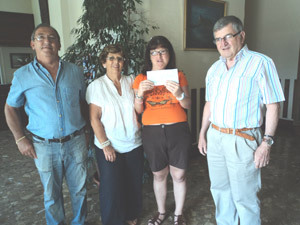 Gibraltar (R), Natalie Hall, Personnel Manager(L) with Special Olympicsathlete Malcolm Miel(C) and staff members, receives his sponsorship cheque for £600. Malcolm will participate in Bocce at the World Games in Greece. 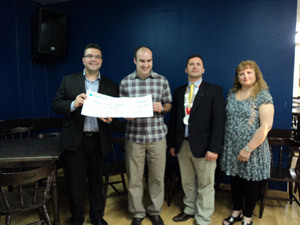 L-R Susan Beresford, Special Olympics athlete Lee Guerrero and Stephan Payas of Saccone and Speed present Lee with his £600 sponsorship cheque. Lee will participate in Seven a side Unified Football at the Games. L-R Richard Hook, parent, Sam Hook, Special Olympics athlete, Stephanie Corbacho, Garren Thompson, Yvette McElwe, Dylan Page. 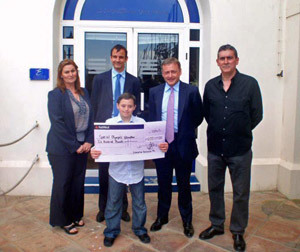 Colleagues at Jyske Bank organised a staff quiz and Garren Thompson(pictured) with Nicholas Wright went skydiving near Seville on 15th May to raise funds(£600) to sponsor Sam, who will participate in seven a side Unified Football at the Games next month. Special Olympics promote inclusion in our community and this effort is much appreciated. The Round Table sponsorship of Special Olympics athlete Nicholas Danino. L-R Dennis Beiso, Nicholas Danino, Guy Povedano, President, Annabelle Danino, Parent. 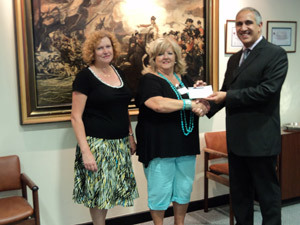 Bassadone Motors have sponsored two Special Olympics athletes who will participate in Aquatics in Athens. L-R CEO Kevin Jones, Francis Mauro, Sallyann Mauro, HR Manager Lourdes Barea, Michael Mauro, parent of Sallyann. Queens Hotel sponsorship. L-R Aurelio Wink, Parent, Rogelia Francis, Special Olympics athlete Virginia Wink, and Ernest Francis. Virginia will participate in Athletics at the Games. Aqua Gib Ltd. sponsorship. L-R Maiwa Finlayson, Superintendent Administration, Peter Latin, Managing Director and athlete Aloha Finlayson who will compete in Bocce, a first time for Gibraltar in this sport. 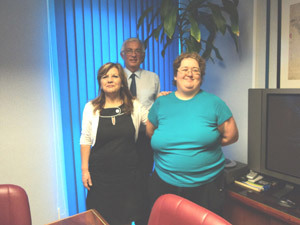 Annie Risso(center) Programme Chief Executive Special Olympics, (L) Susan Beresford, HR Manager and Prakesh Nagrani, Financial Director. Update: Saccone and Speed sponsored a Home Reception for athletes returning from the Summer Games 2011 in Athens. Click here to view the post.